Richly moisturizing and calming, with Vitamin K and Willowherb Extract to reduce visible redness while soothing the skin. 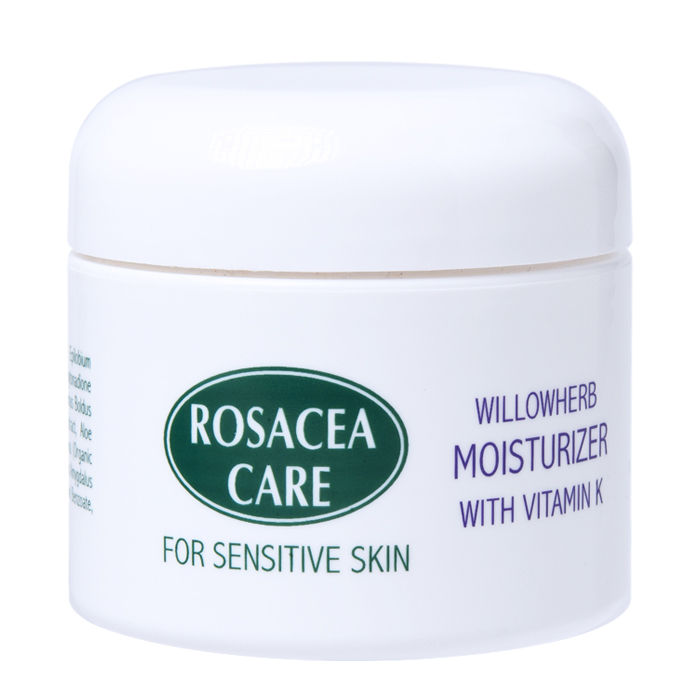 Delivers superb moisture and hydration to sensitive and irritated skin. L-Alpha Bisabolol and other chiral ingredients provide excellent skincare benefits as well as aid in the appearance of healthy skin. Protects skin against dryness and helps the skin retain its natural moisture. It has proven to be remarkably effective in reducing visible redness & calming the skin. Has been used by people in harsh climates for centuries to promote healthy skin. Rosacea Care prime ingredient. It has excellent anti-ageing properties. Aloe vera is known throughout history for its beauty benefits. Helps to soothe and hydrate sensitive skin. Contains cooling properties similar to menthol. Use at bedtime after thorough cleansing. Can be applied over Serum for maximum moisturizing. Use again in the morning. Allow to absorb and then apply your natural mineral cosmetics.